The latest new Closed solvent cleaning system for use with Dowper MC (stabalised Perchloroethylene) is ready to be collected from our manufacturing partners Union s.p.a, in Bologna, Italy. The machine will be packed for delivery to a major surface treatment company in Birmingham, replacing an older enclosed system to meet with the REACH regulations in accordance with the amended safety data sheets for the use of Perchloroethylene in surface cleaning. D&S Ultra-Clean are exhibiting at MACH 2016, stand 4687 which is located in the Cleaning section. The exhibition over five days will give the opportunity to discuss all aspects of component cleaning, both solvent and water based, we will have a small selection of our range of cleaning systems with our equipment partners Union spa and MEG. 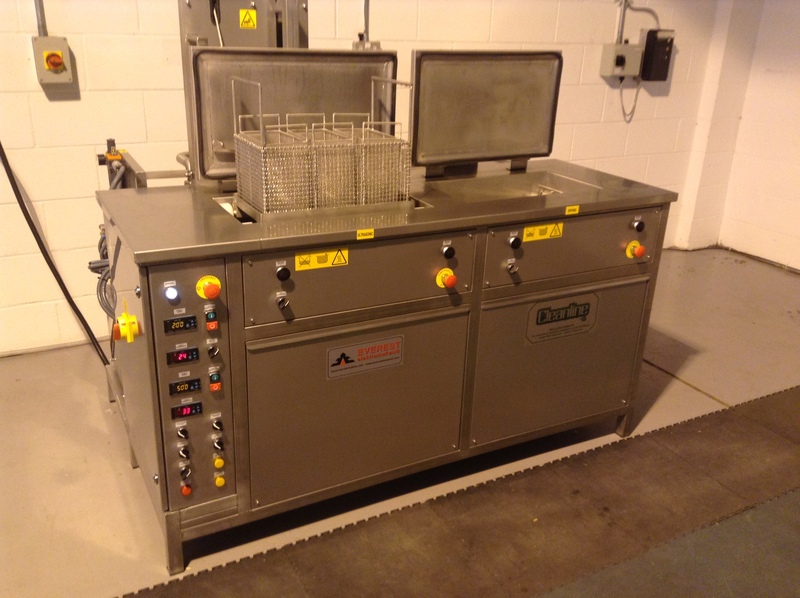 Two of the machines were from our standard MDM range, one for cleaning convoluted tubes and will use the chlorinated solvent Dowper MC (perchloroethylene) and the other is a full vacuum system a MDM V HC model which is to be used for cleaning small components and springs and is for use with Dowclene 1601 (modified alcohol) both products supplied by SAFECHEM in the UK. The third larger system was from our non standard MUMV range and was again for use with Dowper MC and is for use by a major supplier in Aero Engine manufacture. The systems are now being prepared for shipping and are due to be installed in the coming weeks…..
D&S Ultra-Clean will be attending and exhibiting at our Industry Event of Surface World in September. where we will be on Stand 204. D&S Supplies Union Cleaning systems using DOWCLENE 1601 to UK Aerospace manufacturer. The first delivery of two Union MDM2 VHC Solvent cleaning systems arrived on site in Wolverhampton. The complete order is to supply four cleaning systems at the major aerospace manufacturing company. 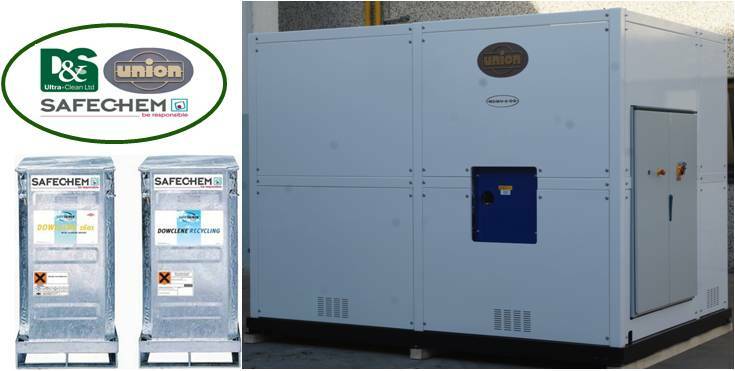 The systems supplied by D&S Ultra-Clean are manufactured by Union spa of Bologna Italy, and will use the A3 modified alcohol DOWCLENE 1601 supplied by Safechem in the SAFE-TAINER solvent delivery system. 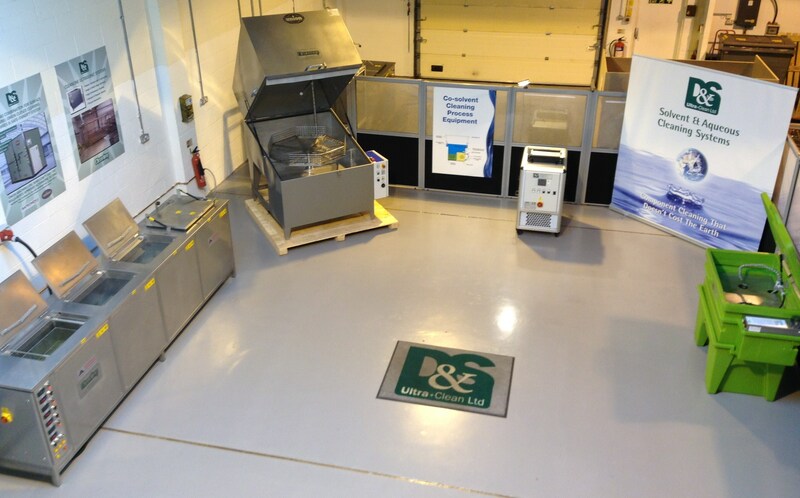 D&S Ultra-Clean’s Cleaning Equipment Demonstration Facility. The demonstration facility at our offices in Runcorn, allows for cleaning process evaluation trials to determine a cleaning process for customers components. 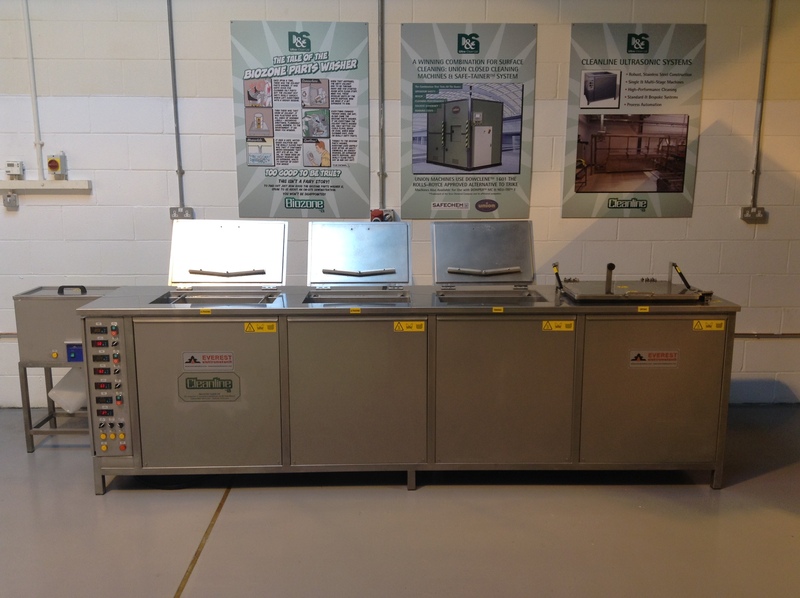 We have both Solvent and Aqueous machines offering Ultrasonic immersion, spray and vapour cleaning as well as our “Biozone” bio-remediation parts washer. Cleaning trials ensure that the correct process is determined for customers requirements prior to an order being placed. This is a free service with a written report for each component trial. Customers are invited to come to Runcorn to carry out trials with us, but if this is not convenient send us your components we will run the trials and send the items back to you with the report. For more information you can contact us by email sales@ds-ultra.com by phone on +44 (0) 1928 580460 or via the contact page on the website. D&S Ultra-Clean has a demonstration MDMV1 HC cleaning system available for sale. This unit designed to use low-toxicity, isoparaffinic hydrocarbons and A3 modified alcohols to combine high-performance cleaning, ultra-low emissions and guaranteed environmental compliance. The unit has a basket size of 450mm x 300mm x 200mm deep. The MDM V HC range is especially suited to high-volume cleaning of small, precision parts. The Cleaning process incorporates a combination of spray, immersion and vapour treatments with ultrasonics. Component drying is achieved using vacuum technology. Baskets can be rotated, oscillated, or held static to suit the nature and sensitivity of components. The system was installed and filled with Dowclene 1601 supplied in the “SAFE-TAINER” solvent fill system, supplied by SAFECHEM. Latest ‘Cleanseal’ Enclosed Ultrasonic Cleaning system signed off.